Kutztown, PA (July 18) – For the first time in the six year history of the Ronnie Tobias Memorial, one driver swept both ends of the Twin 20’s contested by the USAC All Pro SpeedSTRs. 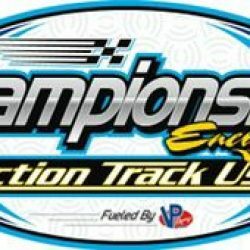 And it was not a name you might expect, such as a Pauch or a Buckwalter, who pulled off the extremely difficult double; rather it was a teen from Allentown named Briggs Danner who smiled in victory lane after each of the SpeedSTR mains on Wednesday night at Championship Energy Action Track USA on the Kutztown Fairgrounds. In the second SpeedSTR main, pole sitter TJ Mayberry and Tim Buckwalter battled for the lead with Mayberry on the bottom and Buckwalter rolling the top. The fierce duel raged for eight trips around the clay before Buckwalter shoved the nose of his Business Link Print.com No. 52 in front of Mayberry as they crossed the stripe to complete lap nine. Danner was third, watching the battle for the lead unfold in front of him, and he went to the whip when Buckwalter took the lead. Just as he made the move to get by Mayberry for second, Mike Mahaney flipped on the backstretch with ten circuits complete. The 40-lap Slingshot main was a good one, with Nick Vinciguerra setting the pace in the early going over Joe Toth. Austin Daniels moved up to challenge Toth for second, passing the No. 9 before Toth reclaimed the spot a few laps later. Brett Bieber rambled from his 11th starting position to run third with 11 tours complete and then, on the 14th revolution, Toth slipped past Vinciguerra to snare the lead and Bieber followed him into second place. The middle portion of the race featured a nose-to-tail, nip-tuck battle among Toth, Bieber, and 14th starter Dylan Hoch. Right behind the lead trio, it was three-wide for fourth position between Dave Carraghan, Daniels, and the previous week’s winner Jared Silfee. With just ten trips remaining, Hoch muscled past Bieber for second. He stalked Toth for the next seven circuits before Toth slipped up the banking just enough to open the inside lane, permitting Hoch to dash past him for the lead. Hoch went on to win his second of the year at the Kutztown Fairgounds track, with Toth registering his best finish of the season by placing second. Brett Bieber rounded out the podium, with Silfee and Dakota Kohler completing the top five.